Bald eagles thrive in Alaska due to its wide open spaces and abundant food sources and there are more in Alaska than anywhere else in the United States. 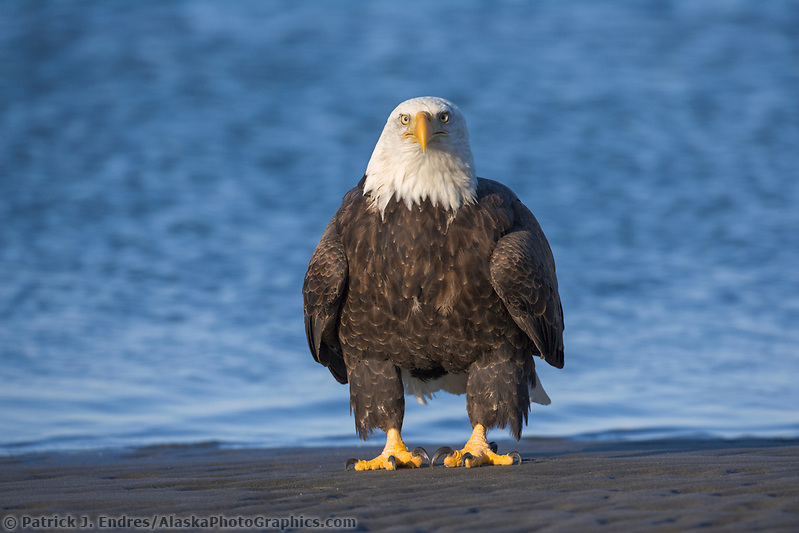 Eagles congregate in many locations along Alaska’s coastal shores where salmon play an important role in their diet. Their distinct white head in mature birds makes them easy to identify. 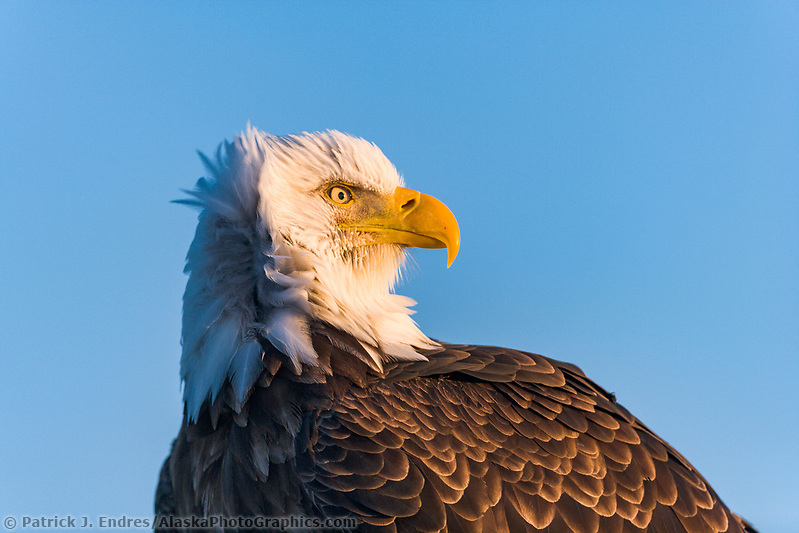 All bald eagle photos on this site may be licensed as stock photos for business use, or purchased as fine art prints for your home or office decor. They were taken at various locations across Alaska. Since bald eagles favor coastal regions where water is abundant, most were taken in Alaska’s southeast and southcentral regions. The bald eagle is named for its conspicuous white head and tail, which appears at approximately 5 years old. Immature birds lack this easily identifiable characteristic and can be confused with the Golden Eagle. 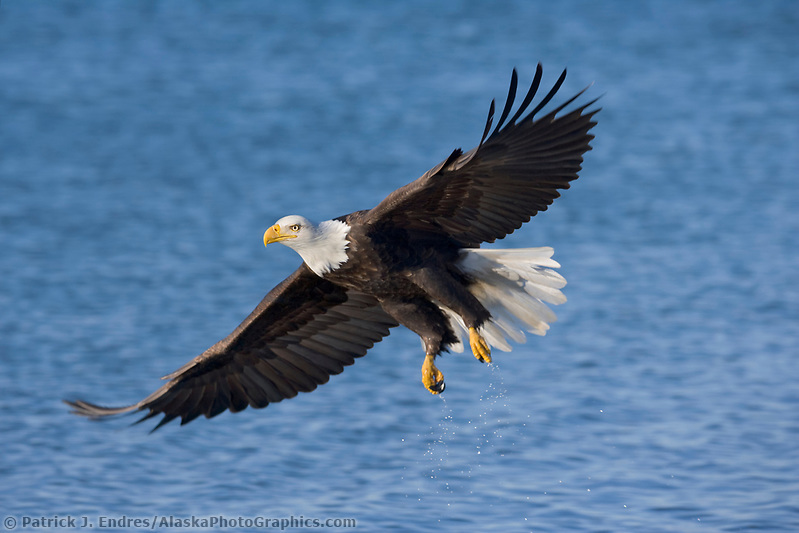 The Bald Eagle is Alaska’s largest resident bird of prey (the Steller’s Sea Eagle is larger) with a wingspan up to 7 1/2 feet (2.3 m) long and weights of 8 to 14 pounds (3.6-6.4 kg). Like many raptors, females are larger than males. 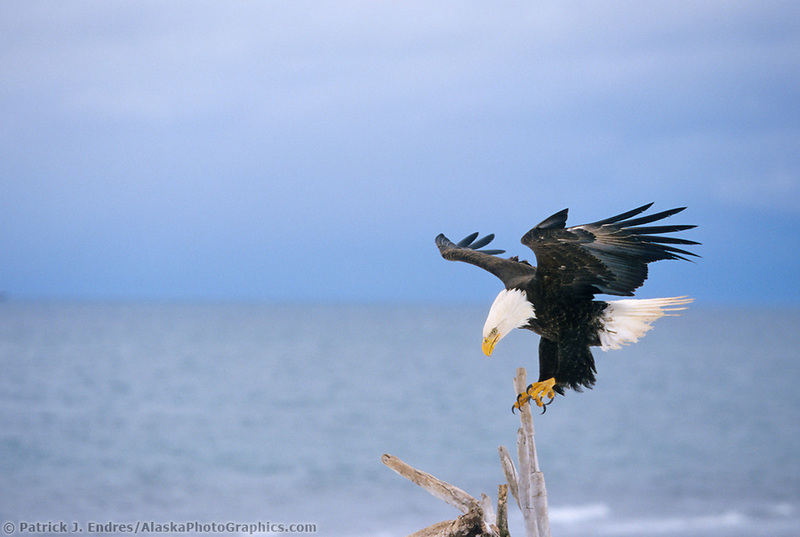 Bald Eagles live along Alaska’s coast, offshore islands, and Interior lakes and rivers. The highest nesting densities occur on the islands of Southeast Alaska. Most Bald Eagles winter in southern Alaska, but some leave the state during cold months. In the Chilkat Valley, over 3,000 birds may congregate in late fall and early winter to feed on spawned-out salmon. Bald Eagles often use and rebuild the same nest each year. Nest trees are usually close to water, afford a clear view of the surrounding area, and often provide sparse cover above the nest. 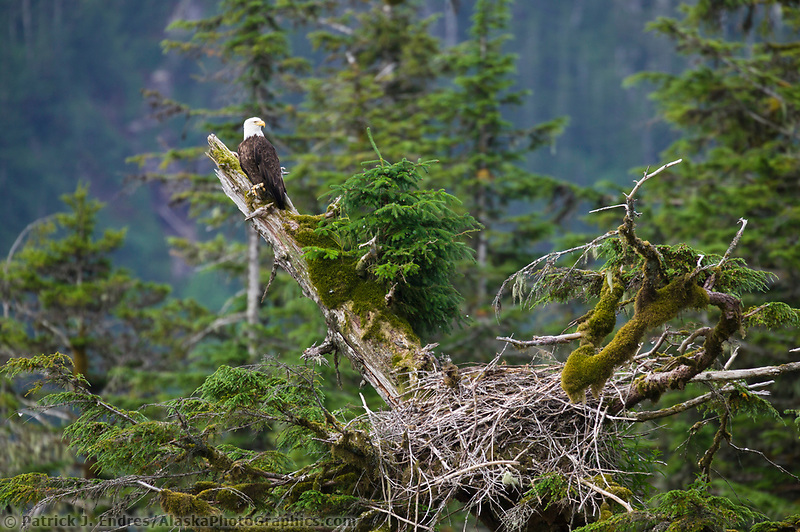 In Southeast Alaska, Bald Eagles usually nest in old-growth timber along saltwater shorelines and mainland rivers. Eagles in Southcentral Alaska nest in old cottonwood trees near water. Nest building begins in April, and both the male and female gather nest material. In late April, two (sometimes three) dull white or creamy yellow eggs are laid several days apart. Incubation lasts about 35 days. When the young hatch, sibling rivalry is common and the weaker, usually the younger chick is killed or starved. The surviving young leave the nest after approximately 75 days. Nest trees tend to be the largest in the stand and are usually 400 years old. In treeless areas on the Aleutians, nests are located on rock pinnacles, or they may be on the ground. Fish are the main diet of the Bald Eagle, in addition to herring, flounder, pollock, and salmon. 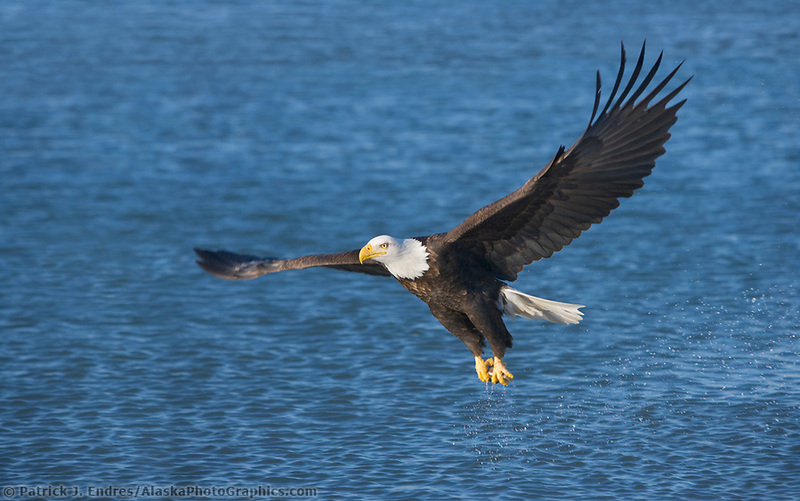 Eagles also prey upon waterfowl, small mammals, sea urchins, clams, crabs, and carrion. With Alaska statehood in 1959, the Bald Eagle in Alaska received federal protection under the Bald Eagle Protection Act of 1940. This act made it illegal to kill or possess an eagle, alive or dead, or to possess any part of an eagle, including feathers. Bald Eagles were endangered or eliminated throughout most of the Lower 48 states as a result of habitat destruction, illegal shooting, pesticides, and poisoning. Bald Eagle populations are recovering in many states because of strong support for endangered species wildlife habitat. 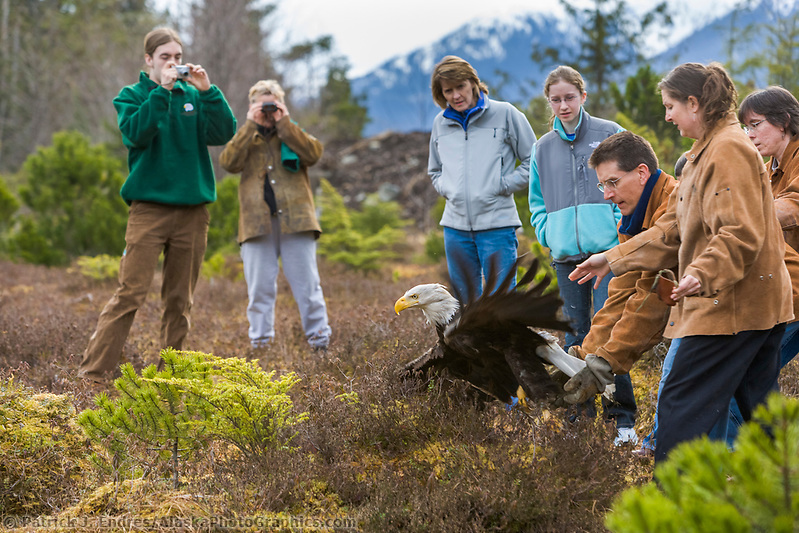 Alaska’s populations remain healthy, but the destruction of nest sites by logging, deterioration of salmon spawning streams by logging, mining, and other development, and increased human disturbance of eagles in remote areas pose potential problems for Alaska’s Bald Eagles. In 1972, the Alaska State Legislature established a stretch of the Chilkat River as critical bald eagle habitat to ensure the protection of the large numbers found there in winter. 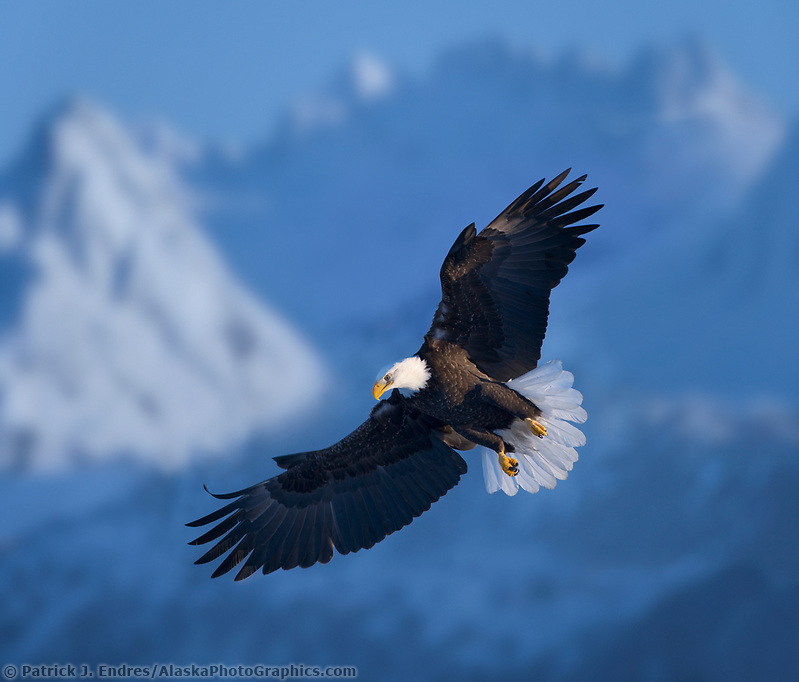 In 1982, a portion of the surrounding area was established as the Alaska Chilkat Bald Eagle Preserve.